Hill was the first and only player this season to have a passing, receiving, and rushing touchdowns in the same game, and he did it again Thursday. The senior signal-caller finished with 401 total yards: 314 passing, 60 rushing, and 27 receiving. His passing touchdowns were a 93-yard strike to Jalen Reagor and an 11-yard connection with White. His rushing score came on a six-yard scramble for the Horned Frogs’ first touchdown, and his receiving touchdown came on a throwback from White that went for 27 yards down the left sideline. 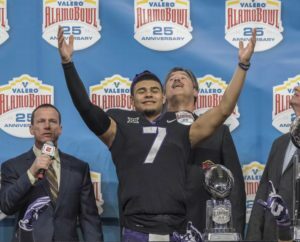 That performance secured him Alamo Bowl Offensive MVP honors. “I told Des just like I told Turp the first time, please, man, if you throw it to me I’m going to score this,” Hill said. White also had a banner night in his game in the purple and black, finishing with 143 total yards and three total touchdowns: an 11-yard receiving touchdown, a 27-yard passing touchdown to Hill, and a fourth-quarter 76-yard punt return that gave TCU their first lead of the game. White lined up as the quarterback at DeSoto High School but transitioned to the role of wide receiver at TCU. As a quarterback, White threw for a total of 3,589 yards with 37 touchdowns and five interceptions, an average of 276.1 yards per game. 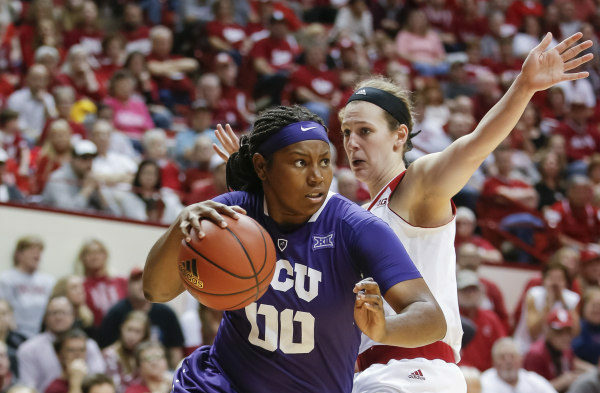 Even with those stellar outings by Hill and White, Stanford punched TCU in the mouth early, leading 21-3 midway through the second quarter. Heisman runner-up Bryce Love gave the Horned Frog defense everything the could handle, totaling 145 yards and two touchdowns. Trailing by 11 entering the second half, 21-10, the Horned Frogs used a little trickery 27 yards from the end zone. TCU threw a curveball as Hill hit White on what appeared to be a screen, but White looked downfield toward the end zone before throwing back to Hill who was left all alone down the left sideline where he sprinted untouched for a touchdown, which cut the lead to five after kicker Cole Bunce missed an extra point. 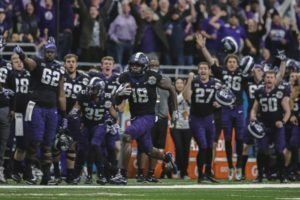 The Cardinals had an immediate counter-punch for TCU as Love struck for his second touchdown, this time with a 69-yard burst up the middle for a score that pushed its lead back up to double digits, 28-16. On the following drive, TCU found the end zone once again. On the Cardinal 11, Hill danced around in the pocket and fired a dart to White in the back of the end zone for a touchdown to give the pair a passing and receiving touchdown each. The strike cut the Stanford lead to five, 28-23, with 5:51 left in the third quarter. The TCU defense stopped the volley of touchdowns after a critical third and six pass break-up by linebacker Travin Howard. Stanford settled for a 27-yard field goal to give the Cardinal an eight-point lead, 31-23. Thr Frogs countered when first-year wide receiver Jalen Reagor ran free down the right sideline, and Hill hit him wideout in stride for the fourth-longest touchdown in program history, a 93-yard strike. The score left the Horned Frogs trailing by two, 31-29, after they just missed the game-tying two-point conversion. With just under 12 minutes to play Desmon White brought the house down in San Antonio. On a 60-yard punt that traveled to the TCU 24, White caught the ball and began to run left, cut back to his right, and after a couple blocks, he had a 76-yard punt return touchdown that gave TCU it’s first lead of the night, 36-31. The score was his first ever collegiate punt returned for a touchdown and an Alamo Bowl record as the longest punt return for a touchdown in the game’s history. The Cardinal wouldn’t go away though, finding wide receiver JJ Acera-Whiteside for his third red zone touchdown of the night on a jump ball reception over TCU cornerback Ranthony Texada. The ensuing two-point conversion was broken up by in the back of the end zone, leaving Stanford with a one-point advantage, 37-36. 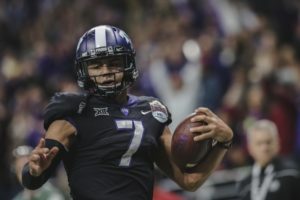 Hill proceeded to march the Horned Frogs down the field over the course of nine-plays to set-up a go-ahead field goal attempt that Bunce hit from 33 yards right up the middle. The sophomore kicker’s second make made him six-for-seven since taking over as the kicker in place of Jonathan Song in the Nov. 11 matchup with Oklahoma. 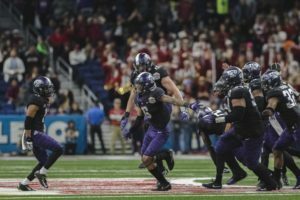 Patterson’s defense stepped up to seal the victory for the Horned Frogs, as safety Innis Gaines intercepted Stanford quarterback KJ Costello with 2:01 left to play. 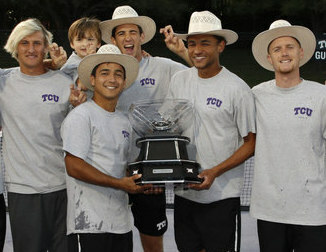 With the victory, TCU finished the season 11-3, Patterson captured his 160th career victory as a Horned Frog, and the senior class finished with 40 wins. It’s the 10th 11-win season since Gary Patterson took over as head coach in 2001. Only 3 FBS schools have had more such seasons in that time. Ohio State (12), ,Oklahoma (12) and Boise State (11). 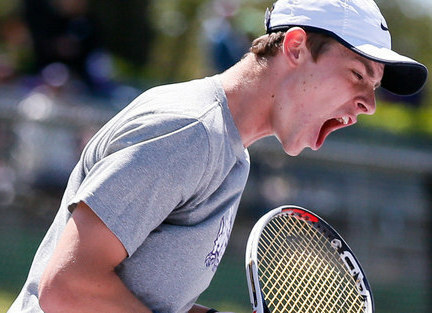 Going forward, the next group of Horned Frogs has a standard to strive for. Robbie is a journalism major at TCU from Raleigh, North Carolina. When he's not in class or studying, you can find him attending the many sporting events across campus, showing his passion for both sports and his university.